If you’ve never seen it, you must. And if you’ve experienced it before, this is the perfect time to re-up, since it’s more pointed and relevant than ever. This is the 25th anniversary of Tony Kushner’s “Angels in America.” The most lauded, brilliant play of the late 20th century (Pulitzer Prize, Tony Awards and dozens more), is political, spiritual, philosophical, historical and hysterical — that is to say, both verbally manic and amusing. The play’s subtitle is instructive: “A Gay Fantasia on National Themes.” It is indeed a heady, intellectual consideration of broadly diverse issues and ideas, presented in a variety of forms and styles (the very definition of a “fantasia”). The fictional characters (each of the eight marvelous actors plays multiple roles) are Mormons, Jews, gay and conflicted men; political operatives; an anguished mother and son; and a neglected, mentally unstable wife. Toss in a heavily accented orthodox Rabbi and a homeless person, and you’ve got a rich, brocaded tapestry of America that (sans the disease epidemic) is not so different from our present time. That’s the genius of Kushner, and his expansive, ever-questioning ruminations. At Cygnet Theatre, artistic director Sean Murray has grabbed this massive, bucking bull by the horns and cast a superlative ensemble. Often with this piece, the Roy Cohn character stands apart from all the rest, larger than life (as played by Al Pacino in the HBO special, for example), grotesque and hateful. Here, in the hands of Murray and consummate actor James Newcomb, Roy is a bit more subdued and seething (he may get more of his monster on in Part II of the masterwork). He’s despicable in his manner and his approach to life and politics, but he’s not repulsive here. Newcomb is effective as the white-clad, 17th century Prior 2, a British fop who’s one of the protagonist’s humorous, over-the-top ancestors (Connor Sullivan plays another one) that appear to the modern-day Prior Walter in visitations. Alex Bodine is terrific as Prior, deliciously fey and smart, attractive, insightful — and in full, horrified recognition of his impending death, which his hyper-verbal, hyper-intellectual, neurotic Jewish boyfriend, Louis (first-rate Wil Bethmann) cannot handle. Louis, who is disparaged by the worldly, weary and wise nurse, Belize (excellent Kevane La’Marr Coleman, revisiting the character he played so well at ion theatre eight years ago), befriends the hapless Joe Pitt (earnest, thoroughly credible Connor Sullivan), who’s the antithesis of Louis in every way: Republican, Mormon, a budding Roy-Boy, and married. And yet, strange bedfellows come of self-loathing. Meanwhile, Joe’s wife, Harper Pitt, knows something is amiss. Her husband is distant, distracted, and given to long walks at night in Central Park. She keeps popping pills, and has a fantasy life filled with travel (enhanced by Coleman’s sparkly Mr. Lies), longing and extreme perception — especially when her hallucination overlaps with Prior’s, and they somehow see deep inside one another. Rachael van Wormer is wonderful as Harper, playing her less spacey and more fearful/anxious, a choice that works well. She morphs effortlessly (bravo to the dressers backstage, and the costumer Shirley Pierson) into Martin Heller, a high-level operator playing the same ugly games as Cohn with justice and democracy. Rosina Reynolds is a marvel in all her incarnations: from the Eastern European Rabbi Chemelwitz (a role in which she is totally, delightfully unrecognizable), to icy, self-contained Ethel Rosenberg, to Hannah Pitt, the no-nonsense Mormon mother of Joe. Debra Wanger takes on five or so characters, portraying each with conviction. But why, when she inhabits the voice of the Angel, do we have to see her doing so, dressed in black, just off the playing-space, speaking into a microphone? That diminishes some of the magic of The Angel. When she finally does appear in all her white-winged glory at the end of “Millennium Approaches,” she is heralded with a fanfare of music and light, but her voice should be equally amplified, and enhanced with reverb to give the heavenly presence more heft and gravitas. The design of the production is intriguing. The set (Andrew Hull) is a minimalist wall of blocks, on which expanses of color or strips of light (Chris Rynne) can be projected in fascinating ways. The sound (Steven Leffue) is evocative, though it never really conjures the beating of giant wings as described in the text. And I missed those feathers, floating down from the flyspace, to foretell the approach of The Angel. But a whole lot more of everything — ideas, characters, conundrums — is on the way in Part II, “Perestroika.” And an underlining of the themes broached in Part I: stasis vs. movement, fear of vs. desire for change. Yes, it’s long. But the time really flies; so much is going on. See this, and then see Part II. You won’t want to miss a moment of this epic masterpiece. 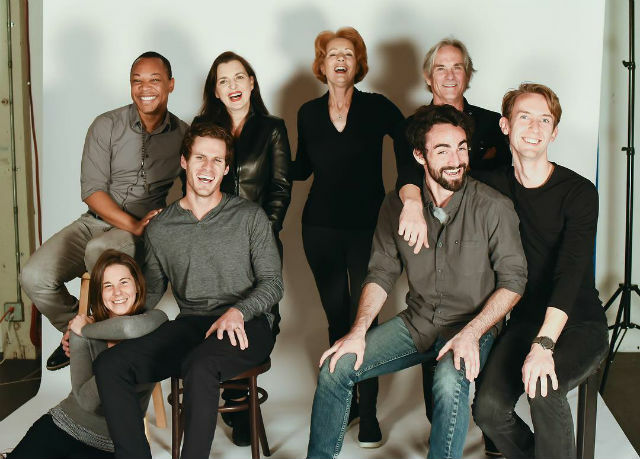 The show will play in rotation with “Angels in America, Part II: Perestroika,” which begins previews March 22, and also continues through April 20. The parts should be seen in sequence. Running time: 3 hr. 15 min.